Braided hairstyles are art that originated from African culture traced back to 3500 B.C. and have been developing in style ever since. They are also known as Cornrows. They were a unique way to identify different tribes. The pattern on the braid was unique to each individual. They were distinguished as per their tribe, marital status, age, wealth, power and religion. French style braid– braid three sections of hair starting from the hairline with gradually adding more hair to the outer part. Dutch braid – Very similar to French braid except that each section is placed over one another. Waterfall braid –it’s a dutch braid plaited across the head. 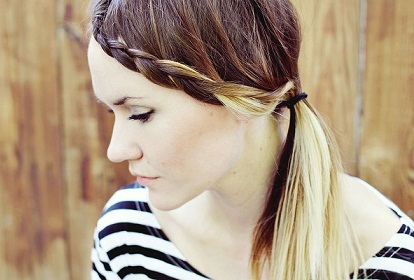 Four strand braid – it gives a 3-D effect and adds thickness to the hair. It involves 4 sections with 2 and 4 knit over each other and 1 and 3 over each other. Braided hairstyles are the go-to hairstyles for any occasion, especially during the summers. Whether a casual attire or styled for special occasion braided hairstyles are most reliable and most comfortable to maintain. Braided hairstyles have also been frequently spotted on the red carpet. There are many ways to style it and look stunning on anyone when worn right. This article gives the list of braided hairstyles along with images that make your presence more alluring. If you have been braiding your hair to school, then you surely know what a simple French braid is. This is the most common braid hairstyle of all. This is gives a very classy look. 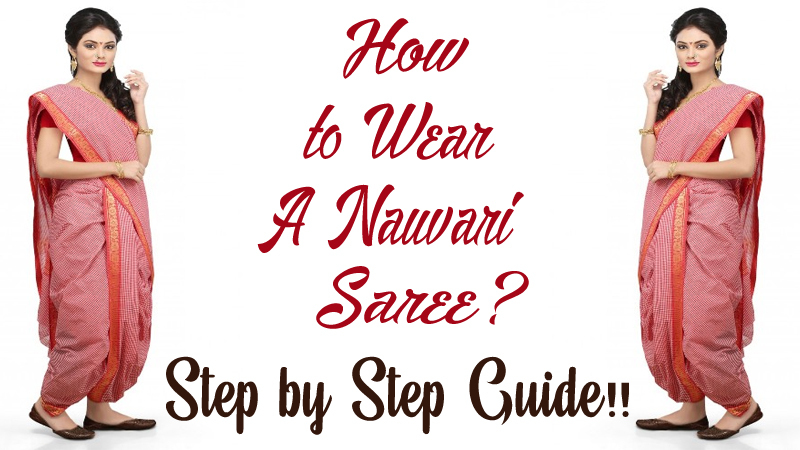 This mostly suits ethnic outfits like salwar kameez and sarees. This would also blend in, if you are trying to pull off a fusion outfit. Fishtail braids seemed to be the one of the trendiest braids at the moment. 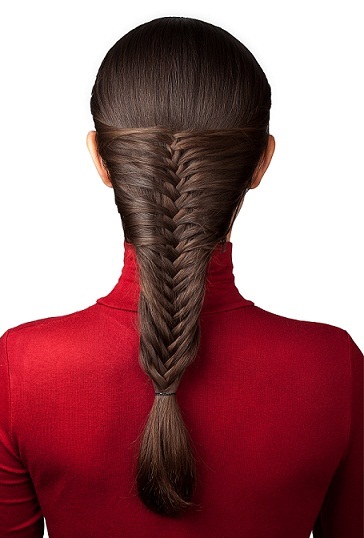 The braid resembles a fish tail – the reason for which it is named a fishtail braid. Be it a casual evening or day out in the heat, fishtail braids are the fun thing to pull off. Wear a strapless or one shoulder or noodle strap top and let your braid fall on the open shoulder. A half pin curl though slightly vintage is a completely hot hairstyle that could never go out of fashion. Team it with a side braid, and see how classy you can make the whole look seem. You can try this look for a fine evening get together or an event. The trend at the moment seems to be having a slightly messed up hair. 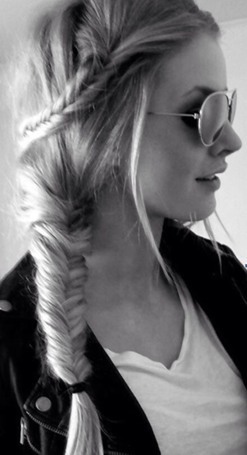 A messy fishtail braid hairstyles is usually very edgy and casual. Now, if you have asymmetrical bangs, this would just make the look even more astounding. Buns are another very common hairstyle. But here is a hairstyle that mixes two hairstyles together. 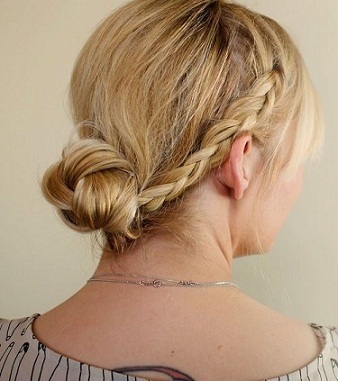 A simple French braided hair is simply tied into a bun, in this hairstyle. This is a very formal style. This would work great for working women, who like to wear suits and formal attires. Updo is a messy hairstyle, which is usually hair pinned and held together with clips and pins. 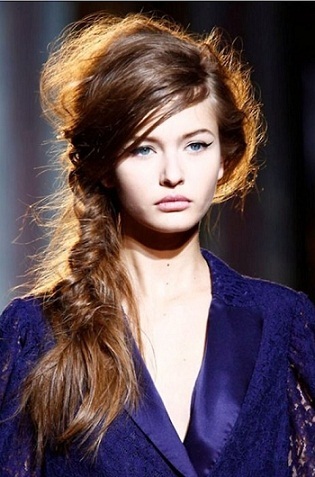 Updos have been in trend for being one of the messy yet arranged hot looks for this season. Take a small portion of your hair from the side, braid it and line it across the front of your head before you do an updo, and this style is set. Casual day or a fine evening this look would definitely draw some attention. The milkmaid braid is also known as crown braid. The braid usually encircles the head, making it seem like a crown, which is the reason it is called so. Women who have bangs can pull off a much cooler look with a milkmaid braid, by letting the bangs look slightly messy, and undone. Yet again, this is a very casual for evening events. Braided bun as mentioned earlier is one of the most formal looks. Buns are usually experimental and braided buns can be experimented too. Here in this case, you can braid your hair to side, and then roll up your hair into a bun hanging lower. Since it is braided to one side, the bun also appears on one side. And there you have the low sided braided bun. In case your bangs have started to grow longer and you don’t plan to cut them but still want your bangs to seem amazing, then braid your long bangs and pin them to one side with help of clips or pins. This would give the effect that you have hair band across one side as well. Let the rest of your hair loose, and pull off a casual look with t-shirts, kurtis, etc. This could make an ideal college hairstyle. 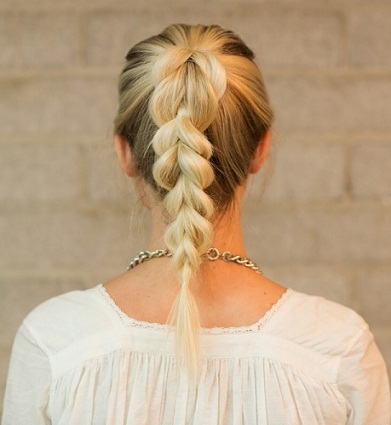 This is one of the easiest braid hairstyles to do. The hair braids are made to appear like a band over your head, which is why it is called a braided band. The braided band can be done by parting the hair into two sections, braiding them separately and then crossing them across the head to make it look like a band. This type of braided hairstyles for perfectly suitable for girl with long hair and spades and modern dress. With bohemian and hippie cultures making trends again, a hippie braid is hard to be out of trend. This is a very simple braid hair style. The braid is usually done by taking few locks of hair and then braided and pinned to look like a band across the forehead. This would be an amazing hairstyle for college girls. This is done simply by partitioning the hair in the middle and taking small locks of hair on either sides and then braiding them. The rest of the hair is left loose, and the braid mingles in with the rest of the hair. 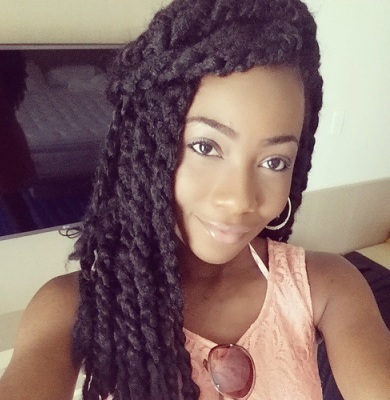 this types of hair braids are so beautiful with curls and suits for any type of parties. This is different from a total side braid. In this style, the hair is let loose. The hair is partitioned to one side and taking a small lock of hair, you braid it and pin it in such a way that it circles almost half the head. This is another style that best suits college goers. A bun with braided band is one of the best hairstyles for a trendy summer look. To get the perfect style, first take a portion on hair from the crown with a slight puff and place a slide pin. Then start French braiding the hair from both the sides towards the end of the hair. Now pull all the hair to make a loose ponytail and twist it into a stylish bun leave it as is or wrap the bun with a simple ribbon to add some charm and opulence. You can also try a fishtail braid for longer bangs and let the hair loose. You might need the help of a friend while doing this, since it would require lot of work. But if you could get it done, there is nothing better than his hairstyle for an evening or a gathering. It would look amazing on cocktail dresses. When you are looking for braid hairstyles, make no mistake about this Bohemian hairstyle that you are bound to fall in love with. To begin this one, all you need to do is put each section of hair into braids, which is usually two sections. Once the braids are done, pin them back together at the back. There will be some hair left in the end, use a curling iron to make them soft, and put up a beachy look. Too lazy to take care of how you step out of home, are you? 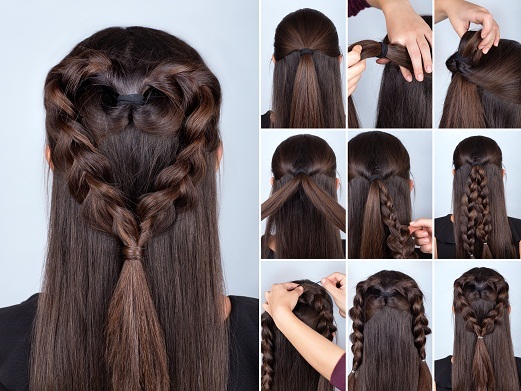 Don’t worry; we have easy braided hairstyles to sort your dilemma as well. This one needs no prominent hair care and can be done with in no time. You can just try out a simple twist first, and there after take it back to your crown and pin it up there. 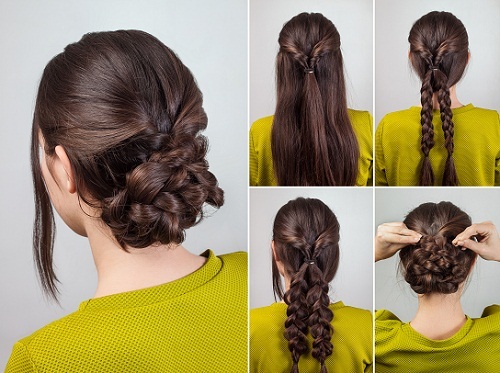 With that your crown braid comes to an end. You probably still aren’t over the first hairstyle that we just discussed on the number 16th one. Well, the two strands on your hair has Dutch braid, you shouldn’t be the one to complain. This braiding hairstyle is really easy and you can literally wave goodbye to your headbands and useless accessories, and step out in style. The next braid hairstyle on our list is very stunning and you will literally leave others guessing how you got the whole thing going. 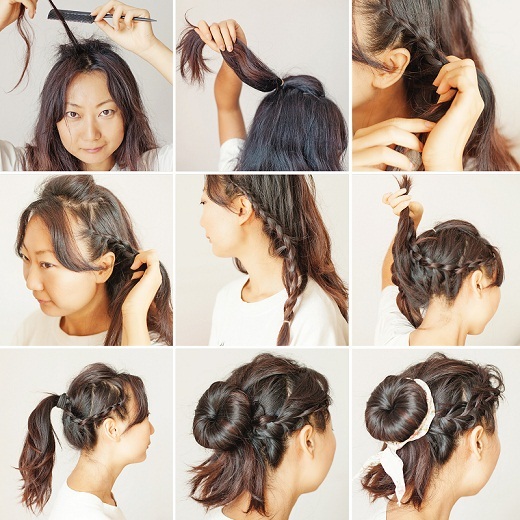 Tie your hair first into a high ponytail to begin. Next, divide your ponytail into two separate sections. Use elastic to secure your hair and pull it through the middle. 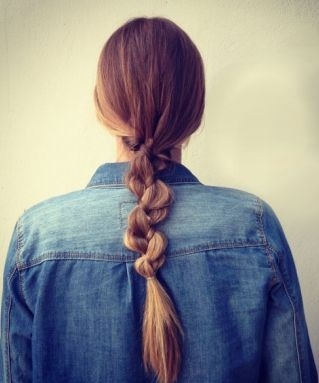 Braid until the way down and use this method till the end. That should be all you need to know to look good. Braided hairstyles are many, but this cute one features double braided bun is a great way to escape the heat while you still can. You don’t have to look weird in doing so. When you pull your hair back into this knot you literally open a quirky style and chic up do. 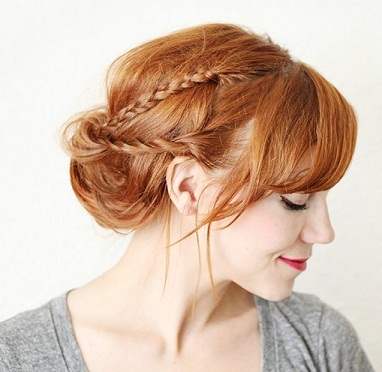 It is easy to recreate this hairstyle and simply feed the whole braided hair into the bun to transform your look. The good old vintage days are back and look what it brought along the milk maid braids. 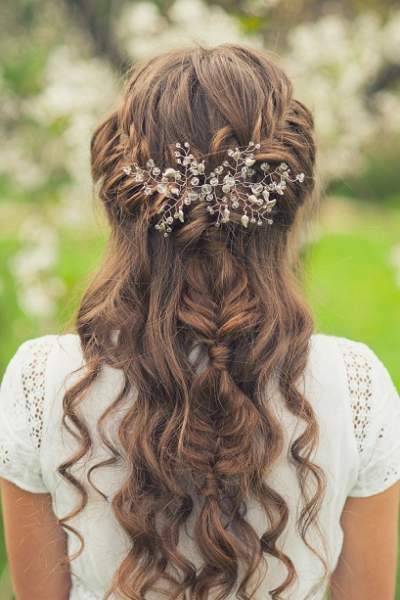 Popularized by Shakespeare, this one is an easier version, and it features a crown braid. It gives you a very relaxed look, and a wavy vibe. 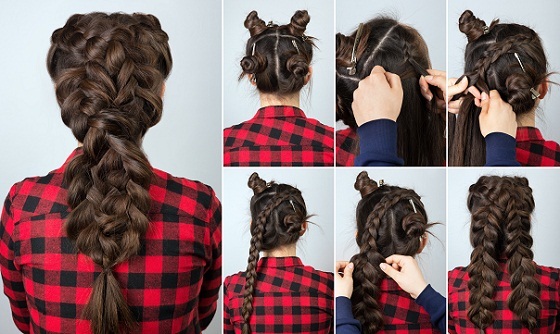 You don’t have to undergo all that hassle of the French braids either. From work to school, this up do is super easy for all occasions. This is one of the easy braid hairstyles with medium hair that looks so beautiful. Messy braids are quite popular these days. You don’t want us to explain why it is so to you either, because we can assume you know. But, let’s get into the hairstyle with your preference. It can become your go-to style. For a charming up do, you can pull some strands from your neatly stacked braid to get this look and give off a ‘I woke now’ look. Now that you have finished looking into the simplistic beginner braids, let us introduce you to the first advanced one on the list. This is something different than the previous ones and perfect for your long hair that gets so hard to manage in a ponytail with all the strands flying around. In case you are bored of the same old hairstyle, here’s one to die for. This braided hairstyle is an easy up do, but one of the lesser known ones among the braided hairstyles. It is more casual than formal and different. Try this hairstyle with flannel shirts and high tops to look your best. Don’t forget those big nerdy glasses though. When you are not ready to have your hair cut short, but envy other girls flaunting their bangs, this hairstyle is for you. You can also try this one out if your hair has reached that awkward phase where it is mid length and nothing suits your look. Just plait like usual and bring your braided hair in front to secure with a clip. That’s it! Among braiding hairstyles, this twist braid is super easy and just perfect for your date night. You can wear anything at all, but this hairstyle will still steal the show in the end. This is one of the most excellent braid hairstyles with medium hair that makes you look awesome. The previous pull out braid we showed has a unique take to it, and this is this one. It gives your hair the uniformity and neatness it needs, while adding the reckless strands along to give a more casual look. Try it and you will realize your hair is nothing less than a piece of art. 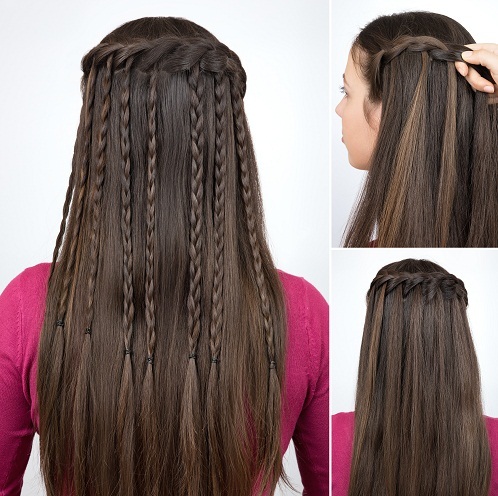 This is one of the ideal hair braids for teenage girls with long hair. This hair braiding style is a different alternative to the ones you are so accustomed to. 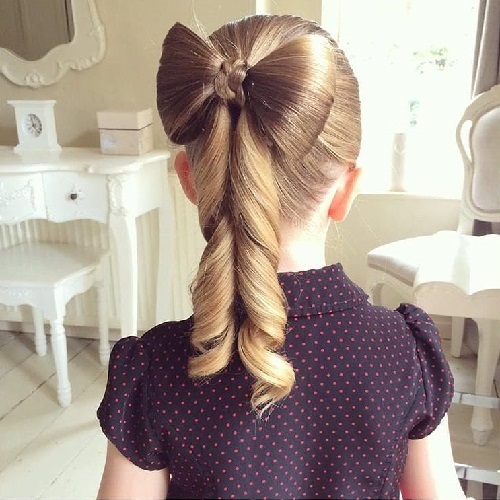 It is unique and has only two essential twists, with the remaining section of your hair tucked into the nape of your hair for a cute up do. 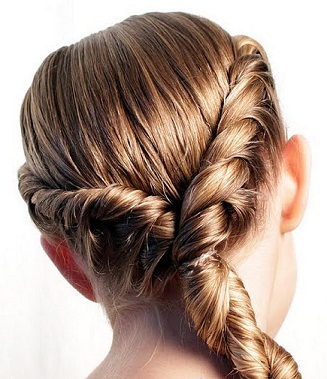 This one is nothing like the crown braid you were probably picturing. Instead, it is better than the traditional one, with a twist in the tail, literally! Left open messy waves with a lovely 3-D braid around the crown is just perfect for a casual outing.What makes the style interesting is that it takes very less effort and is a very chic style to sport. Just pull a generous section of hair from the side and start braiding towards the other end of the side. While back in the 70s this style was a rage, among hairstyle braids, it isn’t a bad one to choose. 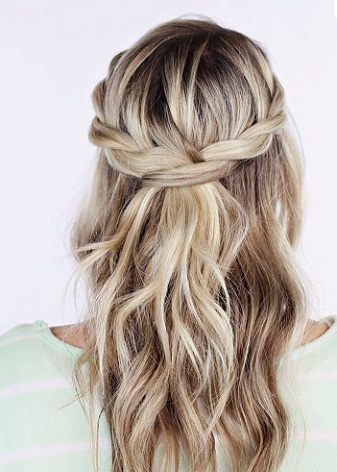 From weddings to date nights, you can easily be the dive you wish to be with this hairstyle. Don’t worry this type of hairstyles braids with long straight hair is surely attracts the others at any where. 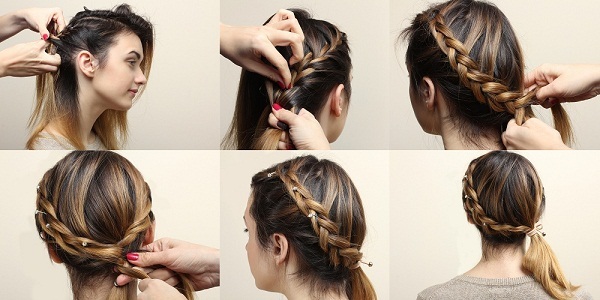 Let’s find here with mentioned step by step procedure to girls braided hairstyles. It is the best braided hairstyle for young girls. If you have thick and long hair you can style your hair in this way. It comes with long strands which extend beyond shoulder length. This effortless look can be worn anywhere. Women with almost all face shapes can avail this hairstyle. 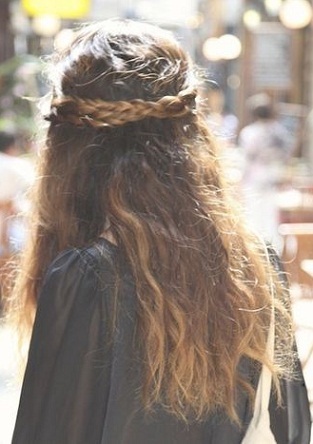 Girls with long hair will rock this look. There are a few steps for styling the hair in this way. Firstly you should comb the hair for avoiding tangles and straighten it properly. Then you should pull the hair back or part it, according to your preference. Make a thick braid with the pulled up portion of the hair and set is loose or shift it to the side. By now you hair will look pretty much like a French Braided hair and there will be small parts of hair which will come out from the top and make the upper portion of your hair look like a crown. This braided hairstyle for girls is a masterpiece. Here the hair is styled like a casual French Braid hair but there are some minute variations. The volume of the hair makes all the difference. If you have dense and voluminous hair then you will be most benefited from this look. The lengthy part of the hair will make the braid a look thicker and wider. For attaining this look, you will have the part the hair in middle equally. Then you will have to create natural braids (with fingers) and take hair sides and do a braid. The braids should not be heavy. 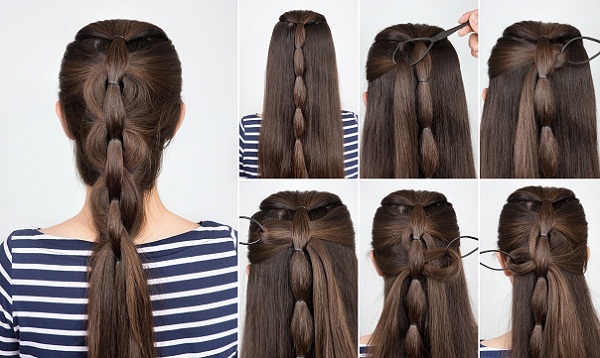 Use an elastic band and tie the hair at the back and keep the rest of the hair open. 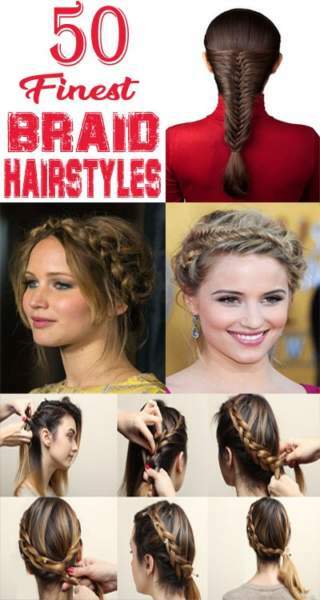 These are relaxed braid styles for girls which is suitable for summer. It gives you a beach look which allows you to put the hair in the middle and tie a braid outlining the forehead. This girls braids hairstyle will be suitable for a wedding ceremony. It is a combination of braids and twists and a cute updo. Here the different styles are mixed together which produces a complicated look. Black women often wear this look. This is a vintage look which is suitable for family occasions. For having this look, you will have the part the side hair and take the large portion of the hair and do a braid. After bringing the braid to the back, establish it with an elastic band. You can tie the rest of the hair to form a shaggy bun at the nape. You can use this hairstyle in pretty much any hairstyle as long as there is three-stranded French or Lace Braid involved. It will work on short hair, medium hair, long hair, layered hair, hair with bangs, combos, etc. 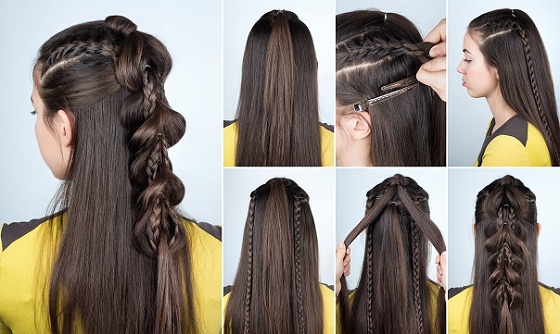 Begin braiding a section of your hair. You can use a lace braid or a three-strand French braid. 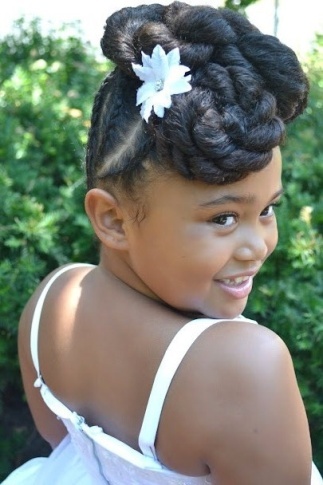 Remember you will need another ½ inch section of hair parted next to your twist to create the bows. This is one of the cutest braids designed especially for Valentine’s day. Its just half pony looped into it and then braided in two parts. Then create heart shape using bobby pins. Finally secure it with an elastic band. 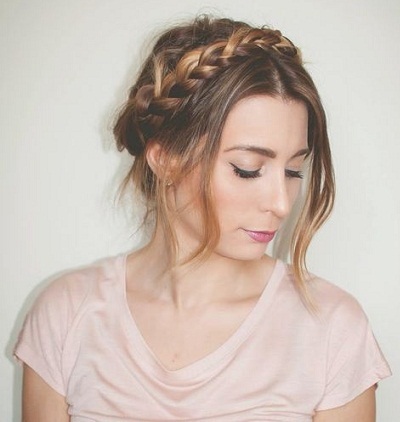 This is a perfect valentine’s day look and is one of the very cute braided hairstyles. A braided bun looks very elegant at the same time gives a fuller appearance to the hair. This is an amazing and latest hair braiding style appropriate for any occasion. It is also very simple to put together and suits anyone. This hairstyle is one of the best unique braided hairstyleswhich also strikes volumized hair appearance. It is best suitable for those with limp hair. You can just perm the hair for the ripple effect which makes the hair look thick. Then just braid along the crown. This is a versatile hair style that suits anyone, most popular in blacks girls as their natural hair texture is apt for this hairstyle. This is another unique hairstyle to give volume to the hairstyle. 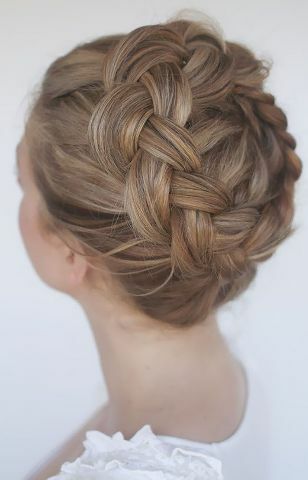 Just divide the hair into 2 partitions and start a Dutch braid from the top of the head. Secure this with an elastic band. This adds volume to the hair and looks good on any casual occasion. This is a very simple and easy braided hairstyle that looks very pretty on any occasion. Just take a small portion of hair from the top on one side and braid it. Then just create a waterfall effect and roll the hair along until the end. This hairstyle also boosts volume to the hair and looks very classy. This is another unique braid hairstyle that looks very pleasing on any occasion. This hairstyle starts from the crown and goes around the head. It is an excellent summer hairstyle and is very easy to style. Weaving plait is another excellent hairstyle to add volume to the hair. It gives a linked appearance which looks cool. It is easier to style this hairstyle using loop tool. Just create loops from the centre section of the hair and secure them with elastic bands. Now keep pulling sections of hair from one side to the other through the centre of each loop. This is a new style of hair braids. 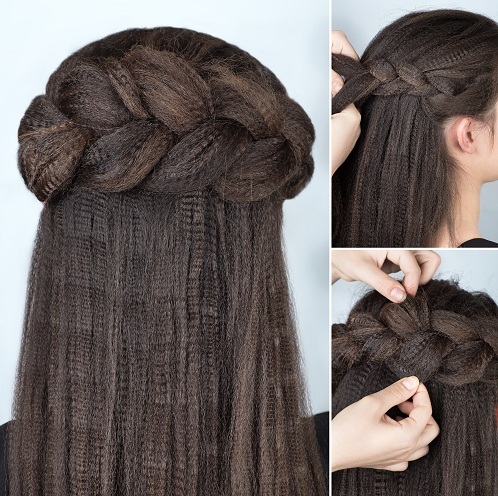 Braided cascade is an amazing braided hairstyle most suitable for long hair. It looks very beautiful and gives a water fall effect. It is styled by braiding a loop style braid along the crown and then braiding small sections linked the crown braid. Suitable outfit – Skirts, dresses, casual pants, Evening dresses, summer dresses. This is a very cool hairstyle and also gives a very trendy appearance. This hairstyle is styled with first French braiding a very small portion of hair on two sides till the end. Then making a half pony of rest of the centre hair and braiding around the two loosely. This is another cool hairstyle for young girls for a trendy look. It also gives the hair that extra volume. 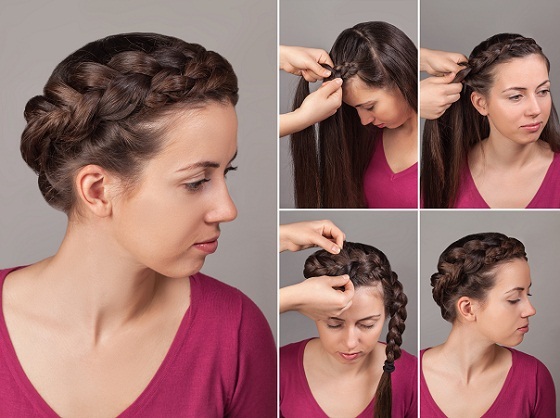 Just make 4 portions of the hair and start French braiding using diagonally opposite sides. Now include both the braids and secure it with a band. This is a very simple and stylish weaving braid. It is a very different and cool braid style. You just need to take a big portion of hair from the side and start French braiding until the rear end to the other side. Now make a side pony. Simple, elegant and stylish. Last but not the lease, the double braid hairstyle will look good on women with long faces. Here the hair is well parted on the side and set loose to take a wavy structure. You will have to establish the hair with the help of an elastic band. You can team these hairstyles up with any casual wear to look classy and sophisticated. If you like low maintenance hairstyles that are cool and relaxed, It braided style will be your token to the zone. Braid hair when it is either wet or damp, so you can catch all the loose ends inside the braid and form a clean, sleek style. If you decide to sleep on your braids, use a silk pillowcase to keep the twist from frizzing or falling out. The tighter your braid is, the longer it will hold, so use a braiding technique like the fishtail or halo braid, to keep slipper hair from falling out. If you’re trying to keep a twist intact for more than a day, don’t use products on your hair for the first day of the braid. 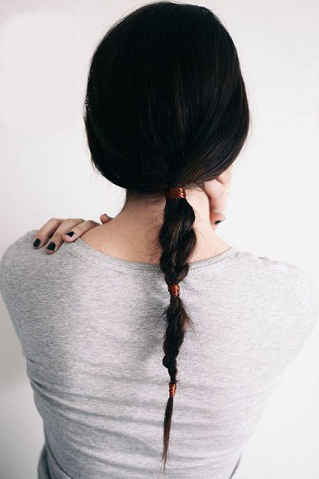 Maintaining longer hair is always better to style a braid. Braiding hairstyles are the best to style those thick hair as it keeps the hair in control and at the same time looks very chic. 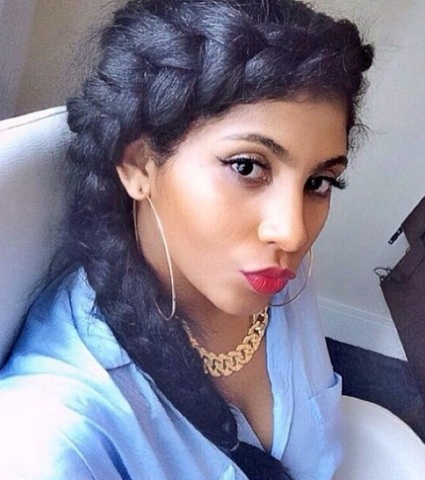 Braids stay stable on wavy or curly hair. On straight and soft hair braids could slip away changing the whole look. In that case a dash of hair spray will do the trick. Beads would look stunning on braids. They would not only look trendy and stylish, but also keep the braids together. Spiral ribbons around the braid would look amazing on little girls and teenagers. They come in different colors to match the attire. Floral accessories and classy brooches wok wonders to get ready for a wedding party. They look pretty on anyone with any face shape. Choosing the perfect braid for special occasions is important. A braided bun goes well with most of formal events. 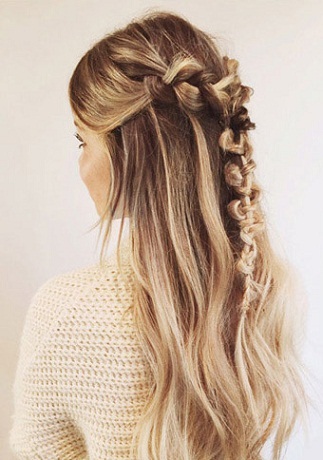 Braids are the best way to style your hair specially when there is no time to wash your hair. 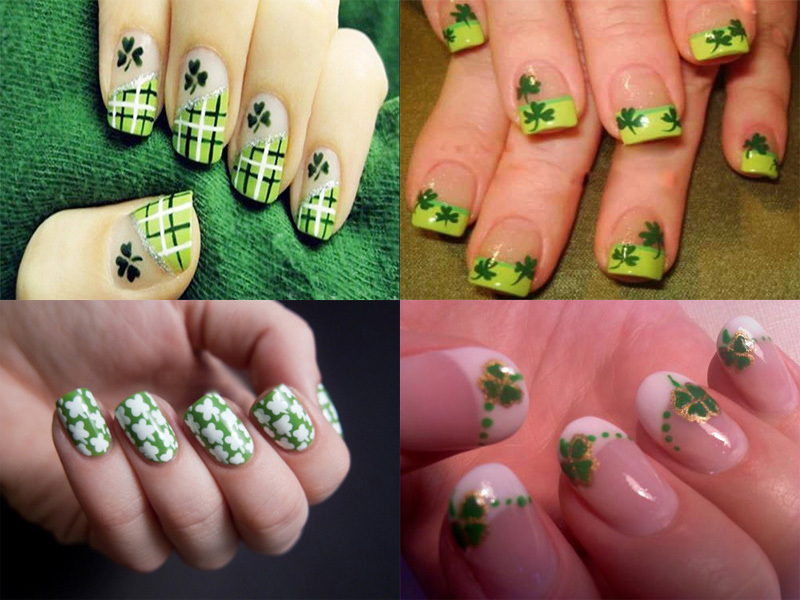 They can be worn neat or messy, either look is fabulous and goes well with many occasions. Even kids love the hairstyle as in this case they can conveniently grow their hair long without the fear of damaging them while they are on the run! 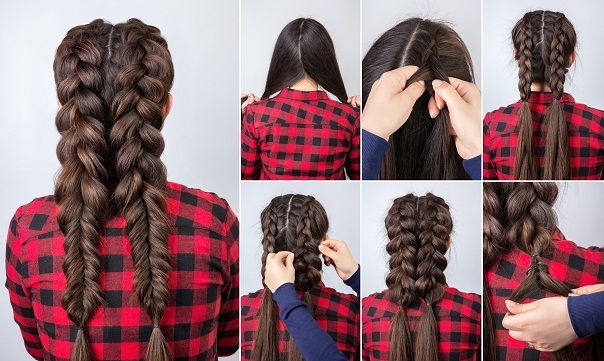 There are many ways to style a braid. Which hairstyle did you like the most and why? Share your comments here. Helpful suggestions are moms welcome. Q1. Why do Africans do the whole-hair braiding? Ans. Braiding is thought to encourage healthy hair growth by minimising damage and breakage from everyday wear and tear. People also believe braiding reduces the amount of time required for daily hair care routines such as detangling and styling. Q2. Does braiding hair make hair grow faster? Ans. Braiding hair strengthens the hair by immobilising strands within the braid. It reduces the hair’s day to day contact with fabrics and objects that cause frictional hair breakage. So we can protect thinning hair and hair loss by loosely braiding before bedtime. Q3. Which braiding hairstyles are suitable for short hair? Ans. Hairstyles such as messy braid crowns, French braids, side braids and many more look stunning on short hair! Q4. Which type of braid suits a silky straight hair? French style braid looks very good on straight hair. It usually calls for tight knots which will help hold the locks together. A waterfall braid is best suited hairstyle for straight hair. The braids can be seen clear and perfectly and would look vibrant on any occasion. It is surely a good idea to add a dash of hair spray to keep the hair intact specially to keep the hairstyle for a long time. Q5. Which braid hairstyle would make the braid thicker? Fishtail Braid is made with multiple sections of hair hence would make the braid appear thick and strong. Rope Braids are also a must-try to add volume to the braid. You can twist each section of the hair and then knit them both together to form a thick rope braid. Four-Strand Braid is the best option to give the braid a fuller appearance. This style gives a 3-D effect which will aids in looking thicker. Q6. Do Braids damage the hair? No, Braids do not cause any damage to the hair. On the contrary, they protect the hair from shedding and breakage. Since most of the hair will be tied, it also protects hair from pollution. I tried out the Waterfall Braid Updo last night for an engagement party. Loved it! Thanks for the links. Will be trying some more of these out with the millions of weddings I have to attend!